The race was a very unusual event and was covered twice by British Pathe News and once by the BBC. For Pathe News go to britishpathe.com, and do a search for Handcross. 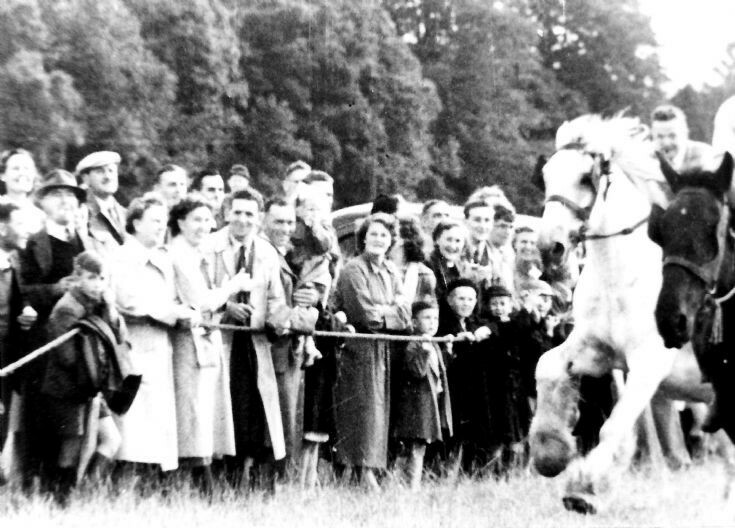 In the 1957 event, organising the apple-bobbing race are Archie Smith and Ted Underdown. The winner of the Derby won the Gordon Richards Cup usually presented by the champion jockey himself. This action photograph shows my aunt, Inez Wilson, clapping her hands with her husband Tom beside her. To their right is Joe Ray holding one of his daughters, with his wife, Peggy Ray (née Munn). Further to the right is Daphne Verlander (née Rapley). I think the daughter that Joe Ray is holding is me! When I was a girl guide in London, it was arranged for our group to camp in Handcross. It had a profound effect on me in many ways. One of my dearest memories was watching the carthorses race towards me. The beauty, the power was emotional and moving and I’ve never forgotten it. I also remember we were allowed to walk to a lake passed a beautiful house that looked Elizabethan to me. The lane had honeysuckle hedges that also lives in my memory. What a beautiful holiday. I think it was either 1949 or 1950.